Rarity factors are scaled from common to extremely rare according to the following, i.e., common in green; moderately common to moderately rare in yellow; and, rare to extremely rare in red. A dark grey background indicates that this species is not usually found in this rock environment. I like to visualize non existing, theoretical things. 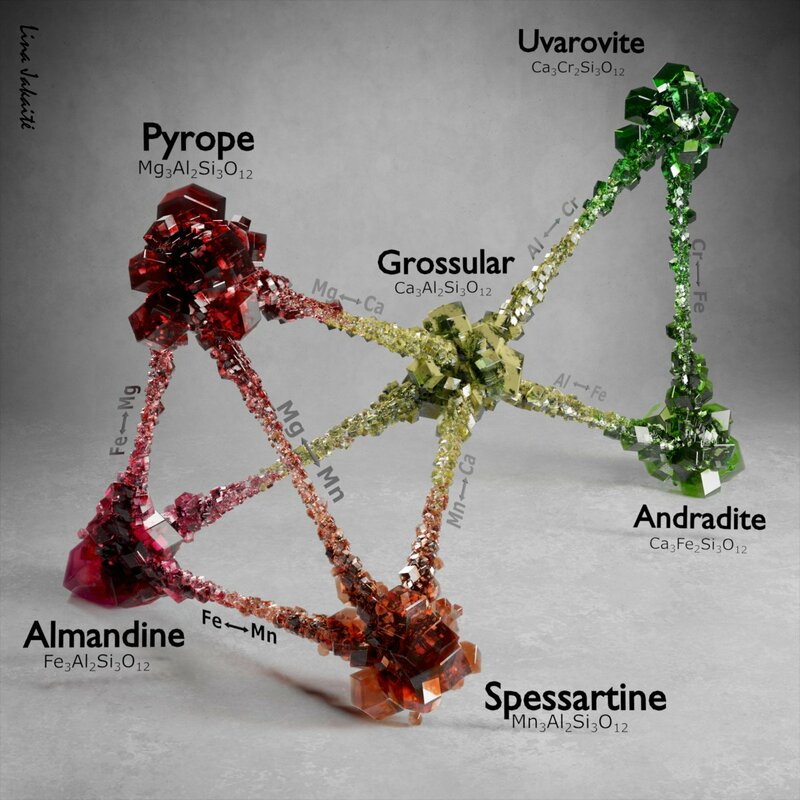 One of these visualizations - relations of garnet minerals. Hope you find this interesting and useful. Mont Saint Hilaire is located 40 kilometers to the East of Montréal, in Rouville County, Canada. Mont Saint- Hilaire has become a classic collecting site and one of the richest current sources of rare mineral species. Here you can look at the three minerals that are mind in Canada. We offer a wide selection of rock and minerals mined in Canada. To this date, 371 species have been identified, of which 50 species are new to science and have never been mind elsewhere. Feel free to browse through saint-hilaire.ca and find all about the rocks and minerals that can be found in Canada.